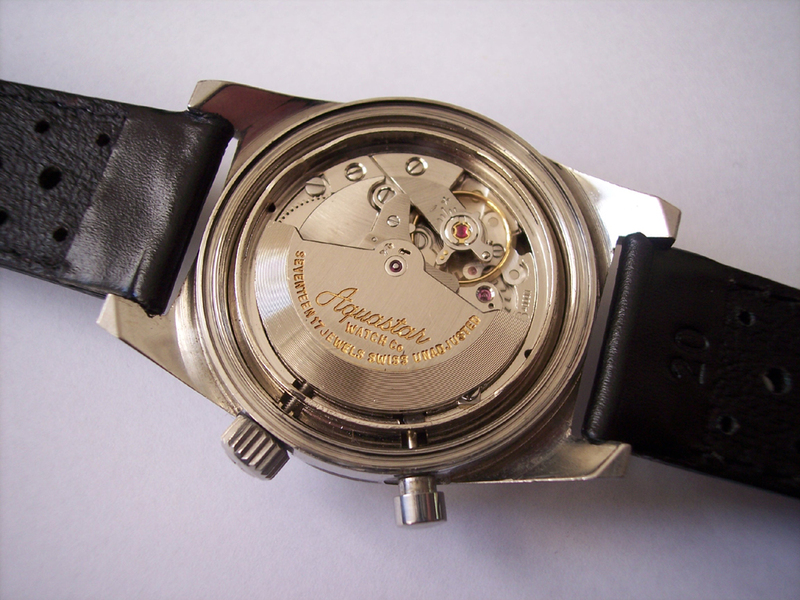 In 1983 the Aquastar company is sold to the present owners, the brothers Gaston and Marc Seinet, and the companies name changed to Aquastar Instruments SA, located in Geneva, Switzerland. The Regate Newport was the last regatta yachttimer with a mechanical movement Aquastar made in the 1980´s. 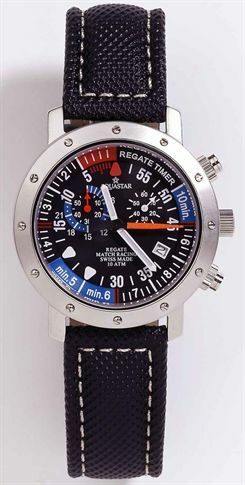 In 2006 they introduced on their website a new regatta watch with the popular caliber ISA 8270 quartz movement, the Regatta Timer series. With the internet now popular, the watches are available through their webshop and their marketing concept is solely based on internet. Aquastar Regatta Timer, RT 8000, 8005, 8070 and 8075. Reference: RT 8000 with steel-grey dial and navy-blue leather strap. RT 8005 with steel-grey dial and blue PU-rubber strap. RT 8070 with black dial and black leather strap. RT 8075 with black dial and black PU-rubber strap. Caliber: ISA 8270 quartz regatta movement. Case size: Ø 41 mm. 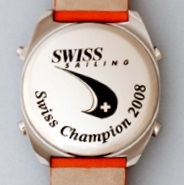 The watches are named Regatta Timer on the website, but on the dial is says ‘Regate Match Racing’. Over the last decade the reference numbers have changed a little, and today only the models RT 8070 and RT 8075 are presented in the Aquastar webshop. You can download a PDF version of the user manual here, and read how the countdown function works. 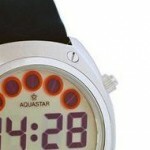 Prototype of the Aquastar Regate Timer, with alarm function. 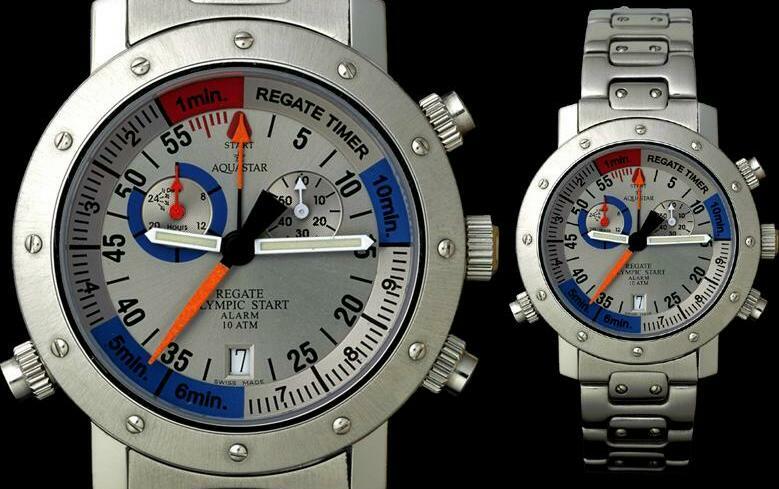 The Aquastar Regatta Timer was first presented as ´Regate Olympic Start Alarm´ with an alarm function, the date window at 6 o’clock and with a steel bracelet. This however was a prototype, and never produced as such. The watch is only sold as in the above pictures. 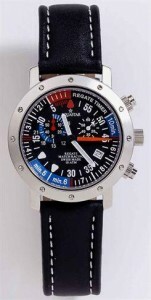 In 2008 Aquastar again launches a new quartz regatta model, the Match Race II . 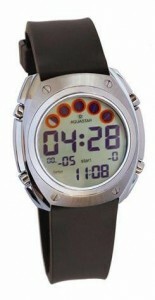 Although with a big LCD dial, it has the 5 balls for the countdown system back in function! Aquastar Match Race II with a big LCD dial and the 5-dot countdown system. Aquastar Match Race II, MR 8000, 8005, 8010 and 8015. Model: Aquastar Match Race II. Reference: MR 8000 with a navy-blue leather strap. MR 8005 with an orange leather strap. MR 8010 with a black PU-rubber strap. MR 8015 with a dark blue nylon strap with Velcro clasp system. 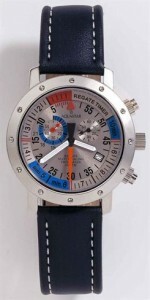 Caliber: Aquastar LCD 9000 quartz movement. Case size: Ø 42,6 mm / H 11,7 mm. Year: since 2008. the model MR 8015 was added in 2010. At first all four models in the Match Race II series had a 90xx reference. 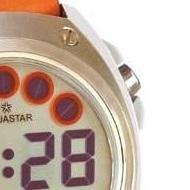 But with the introduction of the Match Race III models, with the same Aquastar LCD 9000 quartz movement, they were renumbered with a 80xx reference. 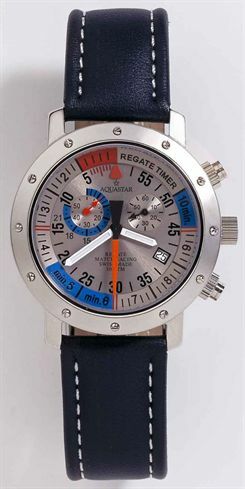 In 2010 Aquastar introduced the Match Race III models with the same LCD 9000 quartz movement, but with a slightly bigger case. The only difference is that whereas the Match Race II models only had the start/stop pusher protected, the new Match Race III models have all 4 pushers protected. And therefor a slightly bigger case of 45,8 instead of 42,6 mm. The existing Match Race II series is renamed into the MR 8000 models, and the new Match Race III series get the MR 9000 reference instead. Aquastar Match Race III, MR 9000, 9005, 9010 and 9015. 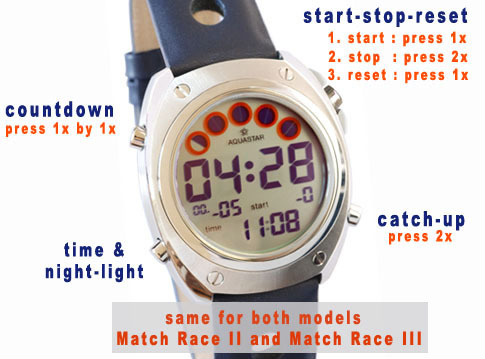 Model: Aquastar Match Race III. Reference: MR 9000 with a navy-blue leather strap. MR 9005 with a yellow PU-rubber strap. MR 9010 with a black PU-rubber strap. 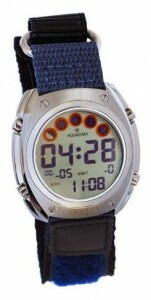 MR 9015 with a dark blue nylon strap with Velcro clasp system. Case size: Ø 45,8 mm. Simplified user manual for both models MR II & MR III. 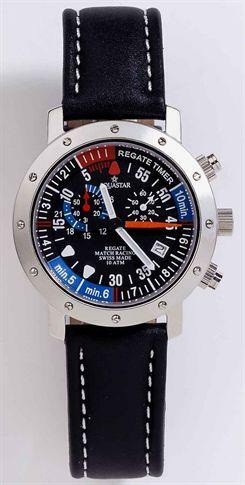 In 2014 Gaston Seinet informes me that studies are being made for the re-launche of an Aquastar Yachttimer with an automatic movement. That would of course be great news, but sofar this didn’t happen. Many thanks to Gaston Seinet of Aquastar Instruments SA for answering my e-mails and your given information.